Front Control Arm Bushing Set (CENTER), Poly 75D for BMW E30, E36, Z3. 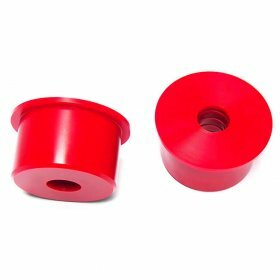 The factory rubber front control arm bushings are soft, wear out quickly and adversely affect everything from steering and alignment to braking. Our hard 75D durometer polyurethane front control arm bushings (FCAB) hold the control arms firmly in place to prevent geometry changes and keep alignment consistent for excellent steering and braking feedback. The unique bushing design incorporates grease grooves for easy lubrication. These extremely hard race-spec 75D durometer polyurethane front control arm bushings are the hardest available (aside from solid aluminum) and the best option for race classes where solid bushings are not allowed, or for those who do not wish to deal with the issues that may arise when using solid metal bushings. Our U.S. Military Spec 75D durometer compound is as hard as a bowling ball, yet has elasticity and memory. This exclusive compound allows us to manufacture a bushing that has virtually the same performance as a solid bushing without the harshness on chassis components associated with solid metal bushings. Likewise, its elasticity and memory means they are also free from deformation which plastic bushings (Delrin, UHMW) are very prone to. Made of our exclusive U.S. Military Spec polyurethane (75D hardness). Set of two. Engineered for a perfect fit. Read why our polyurethane bushings are the highest quality bushings available. Click here for install photo.